I thoroughly enjoyed Jim Lynch's previous novel, The Highest Tide, a gently-paced, thoughtful book about a young nature-loving boy in a small coastal town who discovers a rare giant squid washed up on his beloved beach. 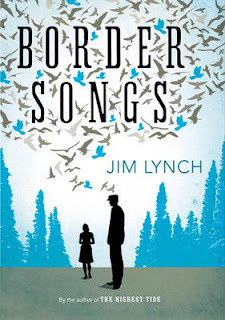 I had high hopes, then, for Border Songs, Lynch's second novel. Set at the western end of the meandering US-Canada border, and focusing on the rural community that straddles it - a community in which Canadian nationals can chat to their American neighbours over the delineating ditch - Border Songs centres on American Brandon Vanderkool, a shy, affable, six-foot-eight oddball who reluctantly joins the local Border Patrol. Brandon, whose uncanny powers of observation and unique perspective helps him accidentally intercept more illegal activity on the border than anyone else, becomes the catalyst for a gradual building of unease and paranoia. There are other characters too. Among them are Brandon's father, whose cows are falling sick on his ailing dairy farm while he channels all his efforts into building a yacht, and his gentle, understanding mother, trying to fight early onset Alzheimer's. On the Canadian side, there's troubled Madeline Rousseau and her sideline in the marijuana business, and her father Wayne, passing his time by replicating the creations of Thomas Edison. Border Songs is a beautifully detailed, sometimes tragicomic portrait of the border community and its eccentric idiosyncrasies. No character is a stereotype and each and every one of them has something in them that touches the reader in some way or another, even the characters who don't seem immediately sympathetic. Border Songs is a surprisingly harmonious mixture of gentle satire and an almost poetic, bittersweet melancholy, punctuated with Brandon's litany of bird calls. It's about what makes us different and what makes us the same, about how even the outsiders among us can find some sort of niche, and how there are some among us who simply see things that others don't. What Border Songs isn't is a significant departure from The Highest Tide, however. Like Lynch's first novel, Border Songs has a nature-obsessed hero, countless references to wildlife species and habits, and is set in a small community in decline in which an unlikely loner becomes the reluctant focal point for a brief period before small-town life settles back into an easy rhythm once again. I loved both books and felt an instant affinity with the principle character in each one, but when I come to read Lynch's third book I'll be looking forward to seeing something perhaps a little different. Hi Joanne, 'elbowpipe' your new follower is Duncan from OU. Inviting you to 'follow' http://talesfromthefank.blogspot.co.uk/. Looked you up among others for a possible online writing group - just looking for the best software to run it. You're probably in a hundred already! Hi! Hope all's well with you. I will indeed follow.